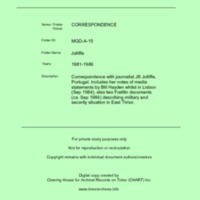 Partial set of correspondence with journalist Jill Jolliffe, Portugal. Includes records of media statements by Bill Hayden whilst in Lisbon (Sep 1984) and two Fretilin documents (ca. Sep 1984) describing military and security situation in East Timor. “Jolliffe [MGD A15],” CHART DIGITAL, accessed April 18, 2019, http://chart-digital.info/items/show/625.